Guess what, my friends. Easter is in TWO DAYS. Are you feeling unprepared? Are you feeling lame and boring? Do you want to make your guests think that you've been slaving away in the kitchen for weeks preparing elaborate confections for them that are almost too beautiful to eat? Then click no further! 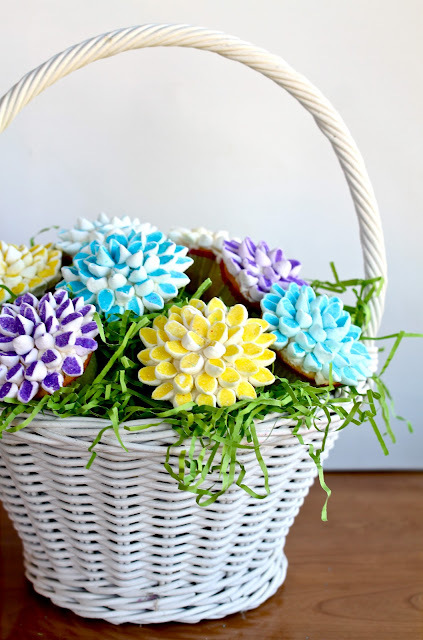 These cupcakes are so easy and fun to make, even a three year old can do it! You can even use a box cake mix if you want, but I did just invent a pretty amazing from-scratch recipe today, so you probably won't want to miss out. Especially since it's smothered in smooth and delicious vanilla bean buttercream. Anyways, these flowers that look so professional... they're as easy as pie. Easier actually. Like waaay easier because pie... it's not actually easy. It's like, as easy as a mug cake. But that's beside the point! I'll just show you how easy they are. First, just cut a bunch of marshmallows in half. Then hire some gremlins to shake the marshmallows in some sprinkles. Arrange the marshmallow petals on the cupcakes. Basically these are just super moist, buttery, fine crumbed, white cupcakes with a smooth not-too-sweet frosting, and a flower that tastes like a really good version of a peep. Cause let's face it, peeps are pretty disgusting. Well, I guess they're okay a couple months later when they're nice and chewy and there's not a single jelly bean left in your secret stash. I guess some things just get better with age. Preheat oven to 375º. Cream the butter and sugar until fluffy. Sift in the flour, baking powder, and salt. Add the 6 tablespoons of milk and mix until smooth. In a small bowl mix together the egg whites, vanilla, and remaining 2 tablespoons of milk. Add 1/3 of the egg mixture to the butter mixture at a time, beating for about 2 minutes between each addition. Line a muffin tin with baking cups and fill each with about 1/4 cup of batter. Bake for 12-15 minutes or until a toothpick comes out mostly clean (it's okay if there are some crumbs) and cool before frosting. Beat together the milk, vanilla, and 2 cups of the powdered sugar until smooth. Add 1/2 stick of the butter cubes at a time and beat well until incorporated before adding the next batch. Add in the remaining 1/4 cup of powdered sugar and beat until fluffy. Frost each cooled cupcake with some frosting (you need enough to help the marshmallows stick, but not so much that it's gloppy and messy). Cut each marshmallow in half diagonally. Divide them into plastic bags for as many colors as you want to do. Pour some sprinkles in each bag and shake until coated. The sugar will only stick to the part that you cut. Starting with the outside, place a ring of marshmallows all around the cupcake. Do a few rings of marshmallows until the entire cupcake is covered.